The Kyle Gass Band Live at Skinny's NoHo with the Raging Peanuts this Wednesday!! FREE SHOW BEFORE 9!! The Kyle Gass Band is playing at one of our favorite venues, Skinny's Lounge here in our home of NoHo, and we get to open for them!!! Show up to see us at 9PM and get in FREE for the whole night!!! Tix are required at 9:30, but not if you've already been there Ragin' with us!! Skinny's is the BEST!! Here is the info on the Skinny's Website. Opening for Kyle Gass Band at Skinny's NoHo on Wednesday at 8:45!!! OMG! The Raging Peanuts are so thrilled to learn that we get to open for Kyle Gass Band this upcoming Wednesday, November 16th! Come see us at 8:45 at one of our favorite venues, Skinny's NoHo, and if you're there before 9:30, you can stay to see Kyle Gass Band for FREE, TOO!!!! See you there, Ninjas!! LOVE YOU SO MUCH! 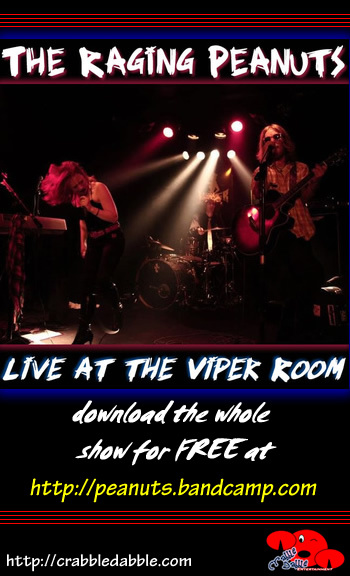 Viper Room Mainstage CD Release Party, Crabble Dabble Entertainment Expands! Book Christmas Singers for Your Parties! Wow! 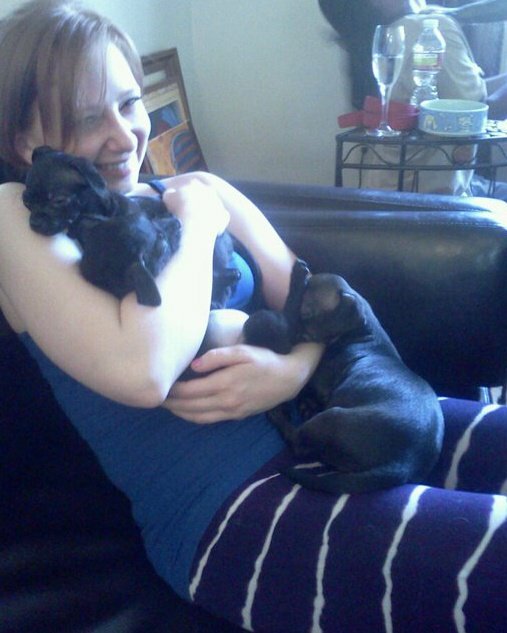 It appears I haven't blogged since getting the puppies! I'm sure you all understand. ;) They've even been doing some rapping... watch out for 3 Dawgg Knyyght, y'all! Big things have been happening for the Peanuts, and my sophomore solo album is underway as well! We had an incredible show at the Viper Room thanks to the Codega Group (we love you, Jaclyn Strong!! ), and even got to bring some of our favorite bands with us! Skinny's NoHo is located at 4923 Lankershim Blvd. "WICKED" BROADWAY AUDITION! RAGE AGAINST AUTISM BENEFIT SHOW! FOSTER PUPS! 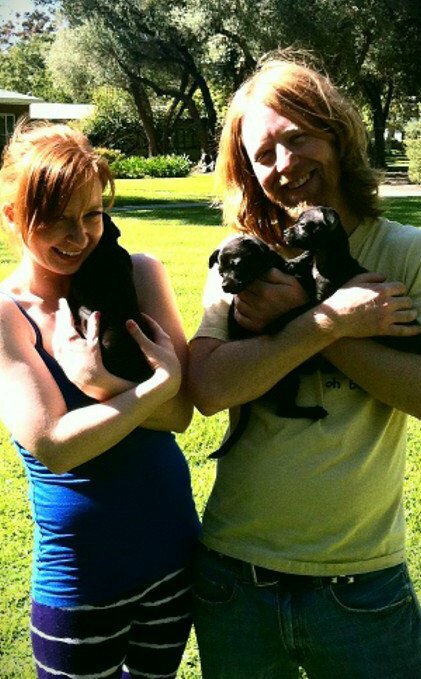 Crazy week, mega short on time... go listen to Langdon Nation to hear all about the new puppies my fellow Raging Peanut and I could not part with!! We're technically fostering for now, but would love any donations to put toward the adoption fees!!!! THANKS!! We ALSO recently had the privilege of 'casting LIVE from the RED CARPET of "RIFT"!!!! Go hear the show NOW! It's totally free, and you can subscribe free on iTunes, too!!!! LANGDON NATION RULES!!!! SUPREME THANKS to everyone who wished me well on the big day when I auditioned for "WICKED" on Broadway!!!! So many beautiful, talented people there, but I sang my heart out and had a blast regardless of the outcome!! I am so thankful to be doing what I love, and have only the highest of hopes for the future!!! :) I love you all, and wish only the best for you as well! 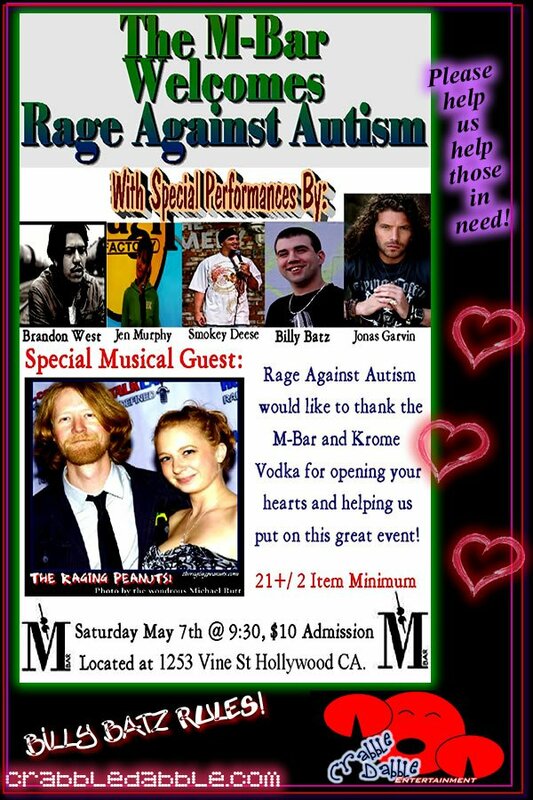 The Peanuts are playing a benefit show for Rage Against Autism on Saturday, May 7th at M Bar!!! It would mean SO MUCH to us to have you there. And, of course, we have our residency at Universal Bar & Grill in Studio City!!!! COME RAGE WITH US! It's FREEEEEEE! MUCH LOVE FROM ALLLLLLLL THE PEANUTS!! 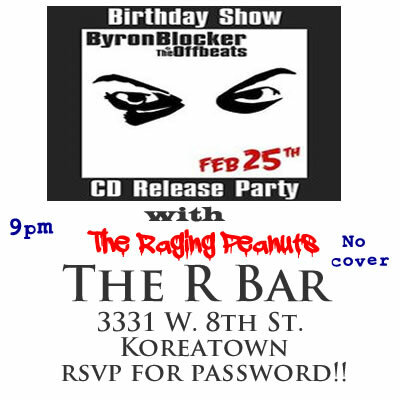 TRP & DJ Nice on the PGP, at UBG, and the R Bar with Byron Blocker and the Offbeats!! We hung out with our super cool pals, Randy and Gina, over at the Wang Hang! Go to their website to listen, or subscribe free on iTunes!!!! I just invaded the PGP again this morning... 'cause our buddy DJ Nice made his PGP debut!!! You can listen now for free!!! We're opening for our friends, Byron Blocker and the Offbeats!! THEY ARE AMAZING!!! You have GOT to come to this show, man! It's free! It's Byron's birthday! It's a CD RELEASE PARTY! Come be a part of history!! We also had SOOO MUCH FUN at the Pretty Good Bingo Party at the Draft and Puff with the Potcast on Presidents' Day!!!!! We have such amazingly talented and fun friends!! The Peanuts love you! Spread some joy! 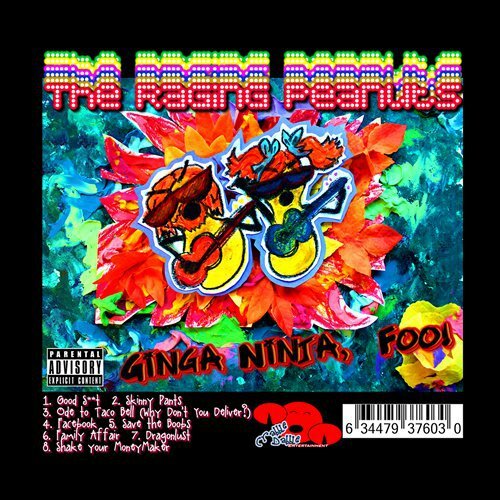 The Raging Peanuts live in the LBC! Puka Bar!! 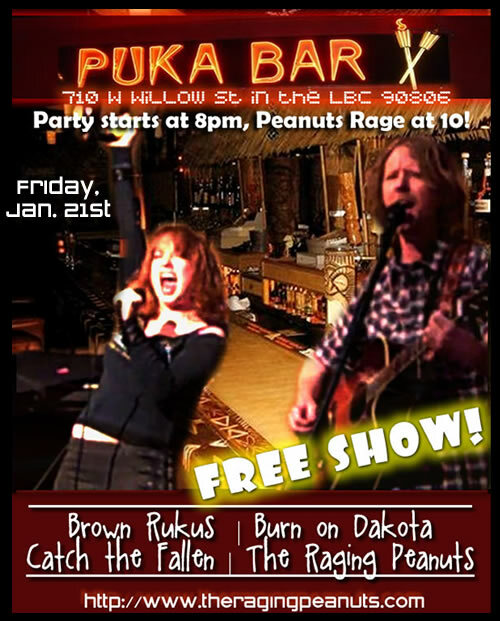 FREE SHOW with Burn On Dakota, Catch the Fallen, and Brown Rukus! Puka Bar in Long Beach! Come rage with the Peanuts for free!!!! Hard at work a-mixin' the tracks! Mary Pascoe... a Raging Peanut.